and helminthic. 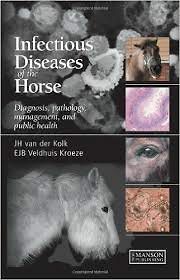 A section on differential diagnosis is then provided to support clinical decision-making, followed by a review of current thinking on the zoonotic aspects of equine infectious diseases, and a guide to clinical pathology to underline its diagnostic importance. Infectious Diseases of the Horse is illustrated throughout by a wealth of clinical and microscopic images, and is of value to all veterinary practitioners, scientists, students, technicians and nurses working with horses.